The United Kingdom Atomic Energy Authority (UKAEA) today announced the final decommissioning of the first reactor in Western Europe. 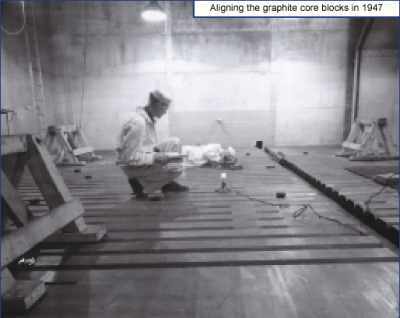 GLEEP - the Graphite Low Energy Experimental Pile - first went critical in 1947 and was shut down in 1990. The contract for its dismantling has been let to Renfrew based Mitsui Babcock. Decommissioning is planned to be completed by autumn 2004. GLEEP played a key role in the development of civil nuclear energy in Britain. It was used in investigations into how to make a nuclear reactor work including the early design and development of Magnox nuclear fuel used in commercial generating stations operating today. It was later used as an international standard for testing materials for other nuclear reactors and for calibration. After 43 years of operation, GLEEP was shut down in 1990 and in 1994/95, the fuel rods and control rods were removed. The final phase of GLEEP's decommissioning and the complete removal and dismantling of the reactor will allow the removal of two hangars and other associated buildings, freeing the eastern end of the Harwell site in Oxfordshire for new development. Total cost of the decommissioning and other demolition work is around £10 million. Dr John McKeown, Chief Executive of UKAEA commented: "The decommissioning of GLEEP is a landmark in the environmental restoration of Harwell and the transformation of the site into an international business centre. The removal of GLEEP, together with other redundant buildings at the front of the Harwell site, will pave the way for delicensing and development of the eastern area of the site." Managing Director of Mitsui Babcock, Europe, Iain Miller added: "We are extremely pleased to be awarded this contract. We have worked closely with UKAEA and sub-contractors to develop a 'best practice' solution for decommissioning GLEEP and restoring this part of the Harwell site for development." Re-development of the site began with the launch of Harwell International Business Centre in 2000. The Gemini office block was built in partnership with ProLogis Developments Ltd in 2001. By releasing more land for unrestricted use, it is hoped to create a thriving hub of science and technology on the Harwell-Chilton campus. The new Diamond Synchrotron being built on the campus which will create 500 science and technology jobs. GLEEP was the first reactor in Europe and was operational from 1947 - 1990. Generally operating at 3kW, GLEEP was used for initial investigations into how a reactor would work and later as an international standard for materials testing and calibration. GLEEP was closed in 1990. UKAEA is working to restore the environment of its Harwell site, removing the nuclear legacies and releasing the land for unrestricted use as a science and technology park. UKAEA has devised a comprehensive plan to develop Harwell so that it can provide quality accommodation and facilities for companies working in the fields of science and technology - from start-up companies to fully developed international organisations. The site has an overall development ceiling of 2.5 million sq ft of new and existing space. Harwell International Business Centre combines an international reputation for scientific excellence with a business environment for the 21st century. The Centre is one of the UK's premier locations for commercial industry working in the fields of science and technology. Organisations based at Harwell service customers in science, government and commercial sectors worldwide. They include The Medical Research Council, Harwell Dosimeters, Harwell Scientifics, Oxford Drying Restoration Services, Amersham, Regenesys Technologies and REVISS Services (UK). GLEEP (Graphite Low Energy Experimental Pile) was the first reactor in Europe and was built in 1946. Generally operating at 3kW, GLEEP was used for initial investigations into how to make a reactor work and later used as an international standard for materials testing and calibration. 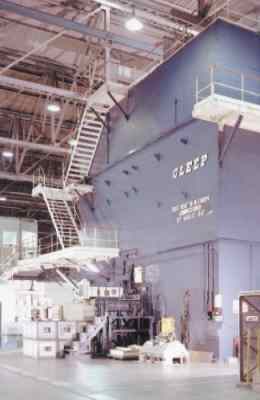 After continuous operation for 43 years, GLEEP was closed in 1990. Until the fuel could be removed, extra control rods were inserted into the core. To take GLEEP to Stage Two decommissioning including the removal of fuel, control rods, and other external equipment, leaving the reactor in a state of care and maintenance until further decommissioning can be implemented. Removal of 11,500 spent fuel rods. GLEEP had only been refuelled once in 1960, so experience of fuelling/defuelling was very limited. Stage One decommissioning, the removal of spent fuel, took place in 1994. This accounted for 99% of the inventory of radioactive materials in GLEEP. In order to defuel the reactor a specialist remotely operated crane was designed and commissioned. The fuel removal machine had a 4-point lift crane, which moved on rails between the graphite core and the bio-shield. Attached to the crane was a fuel retrieval unit. Fuel was discharged by manual rodding from the opposite face of the core, which loaded the spent fuel into trays in the retrieval unit. The retrieval unit then posted the fuel through the bio-shield into a shielded cell where it was manipulated into storage cans and despatched to the waste store. The control rods from the core and other external equipment were removed in 1995. Fuel being retrieved during Stage One decommissioning. All fuel elements were removed and despatched for storage in 7 months. Cross-department working enabled the UKAEA team to enhance productivity and efficiency completing defuelling within time and budget, and resulting in minimal dose rate to operators. GLEEP remains isolated receiving care and maintenance in Stage Two decommissioning. Stage Three decommissioning is planned for 2003-2005.